Isn't the weather a bit bonkers these days? One minute we get some glorious sunshine and mild temperature that spell the arrival of spring; the next, it's howling wind and freezing, gloomy weather that banished all that hopes away. I needed something warm and soothing last night to get me throughout this miserable evening and this dish sprang to mind. Another typical Japanese home cooking that takes no time to prepare at all, yet it is immensely comforting. 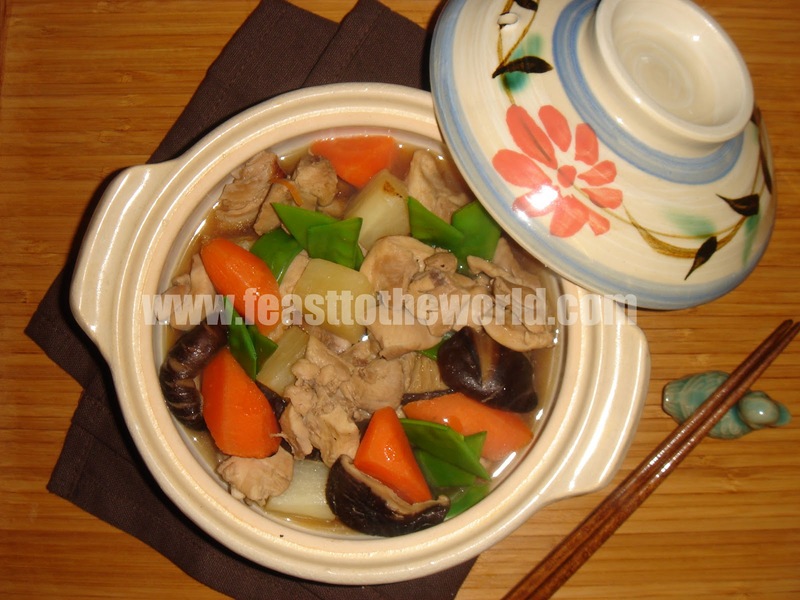 For those of you who are not familiar with Japanese cuisine thinking that they are all notoriously hard and tricky to prepare will hopefully change their opinions with simple fare like this simmered dish. 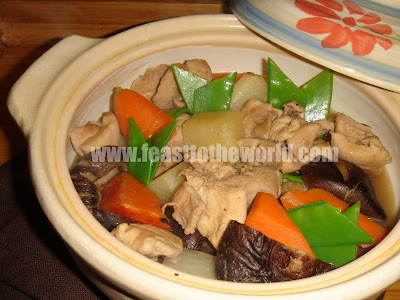 Chikuzen-ni (筑前煮) is a ver popular and healthy dish, native to northern kyushu, that is rich in umami flavour. Soy sauce. mirin, sake and dashi/bonito stock impart a subtle accompanying flavour that complement the freshness and taste of the chicken and vegetables. I have used some of the typical Japanese vegetables here such as daikon/mooli and burdock root which can be found in all good oriental/japanese supermarket. However, swede, parsnip and other wintry root vegetables can also be used and are just as delicious. Cut the chicken into bite sized cubes, place in a bowl and marinade with a tablespoon of sake for 10 minutes. 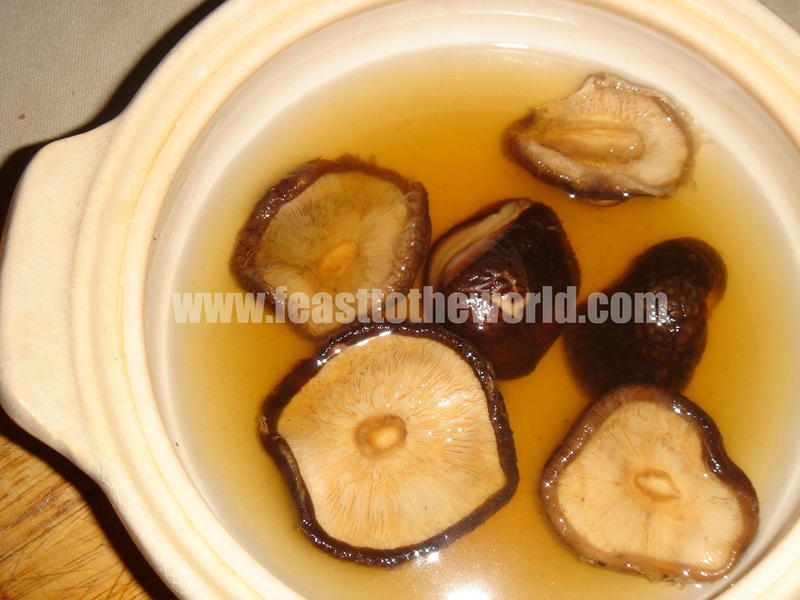 Soak the dried shiitake mushrooms in warm water for 10 minutes to reconstitute and soften. 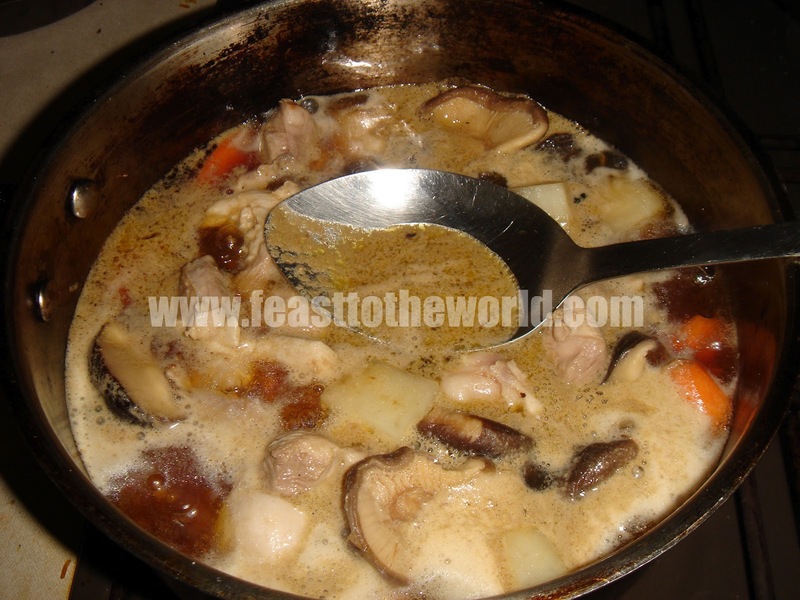 Squeeze out any excess liquid, snip off and discard the stalks with a pair of scissors and cut the mushroom in half. 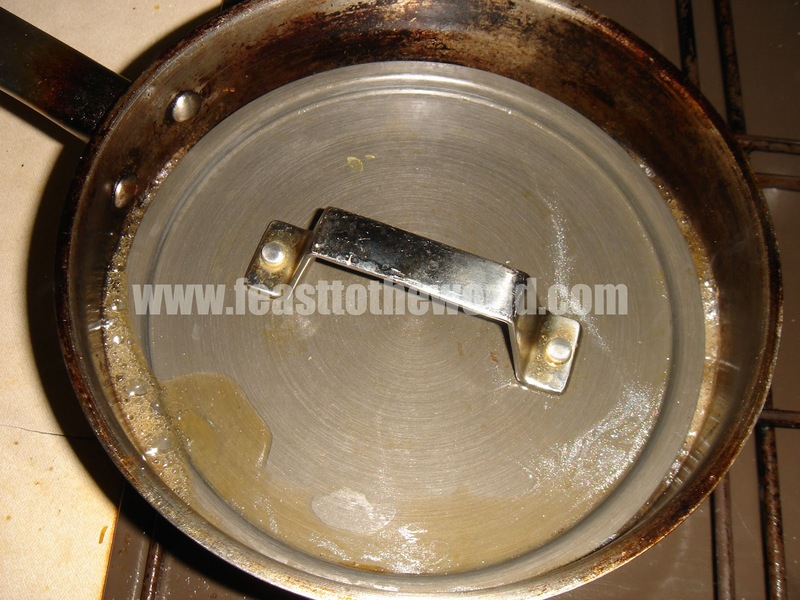 Reserve the liquid for cooking later. Blanch the mangetout in a pot of boiling water for 2-3 minutes, immediately drained and rinse in cold water to stop any further cooking. For the carrot and burdock, cut into wedges using the roll-cut technique (see photo above). 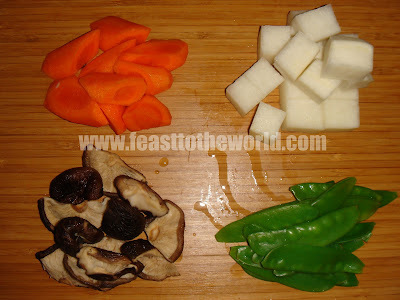 Once peeled, place the vegetable on a chopping board. 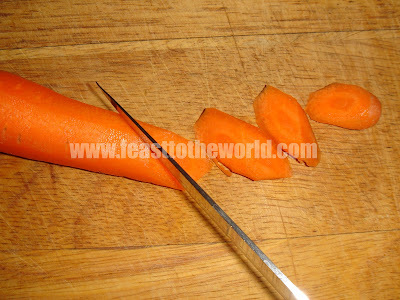 Make diagonal cut while rotating the vegetables a quarter turn between cuts. This creates a beautiful presentation. 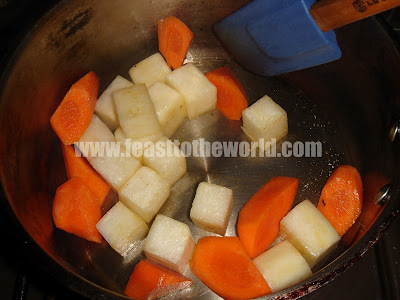 Heat the sesame oil over a medium heat in a pan, add the burdock, carrot and daikon/mooli and cook for 1 minute. Add the mushroom and chicken and cook for another 3-4 minutes. You want to vegetables to sorted slightly but not coloured. Add the reserved mushroom liquid, dashi and bring to the boil. Skim off any impurities that rises to the top.